The Poinsettia, often referred to as the “Christmas Plant”, was first brought to the USA from its native land Mexico, in 1825 by the first US ambassador Joel Robert Poinsett. Today, with the multitude of colors, sizes and shapes available, poinsettias offer an abundance of holiday cheer for every décor. Wagners has a 35-year long tradition of locally grown Poinsettias. 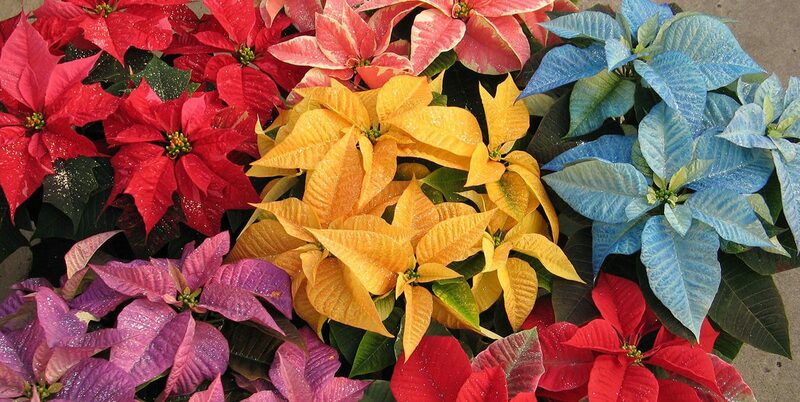 Currently we offer 13 different varieties of Poinsettias. In addition, Wagners also offers custom application of plant friendly dyes and glitter, which make the poinsettia color options unlimited. The most popular dye colors are blue and Viking purple. How to choose your plant? Thinking about the following tips while making your poinsettia selection will help you to have a plant that will last throughout the season. Remember when purchasing your poinsettia to choose the one that is not wilted and has lush green foliage. The actual flowers of the poinsettia plant are the golden yellow clusters (cyathia) in the center of the colored bracts (the colored bracts are the plant’s leaves that changed color to attract insects and not flower petals as most consumers think). As you choose your poinsettia, make sure the plant you choose still has the cyathia. Poinsettias are tropical plants and therefore very susceptible to damage from the cold. When you walk out the store with your poinsettia, remember that the plant needs protection from the weather, especially if the temperature is freezing. A paper sleeve provides the best protection. Additionally, your poinsettia should not be exposed (even in the wrapping) to the freezing conditions for more than a short trip to the car. Do not leave your poinsettia in your car while you finish shopping. If the poinsettia is chilled below 50°F it may begin to drop leaves. Immediately unwrap your poinsettia when you arrive at your destination. Poinsettias naturally produce ethylene. Keeping them boxed and/or sleeved too long can trap the ethylene, which could lead to droopy plants. At home temperatures between 65-75°F are perfect. Locate your plant in a spot with bright natural light, but not exposed to direct sunlight for more than one to two hours. If in a sunny location, make sure the plant never dries out. Do not place your plant in an area that is exposed to cold drafts, heat from appliance, radiators, or ventilation ducts. Your poinsettia should be placed in an area not exposed to heavy traffic. Though not poisonous, the plant should be placed away from small children and animals. Ingestion of the plant could cause discomfort. Poinsettias prefer to be kept evenly moist. Check soil dryness by sticking your finger in the soil about an inch deep. Do not let the soil dry out completely. If the soil is slightly dry, add water. Another way to check to see if the plant needs watering is to pick it up. If it feels light, add some water. Watering is usually only needed every 2 -3 days. Empty any water that drains into the saucer or foil potcover. If you let the plant sit in this water, the leaves will yellow and drop. With proper care it is not uncommon to see poinsettias keep nice color into March or even April. Stop in today to one of our retail locations to pick up your holiday plants and accessories in time for this holiday season!